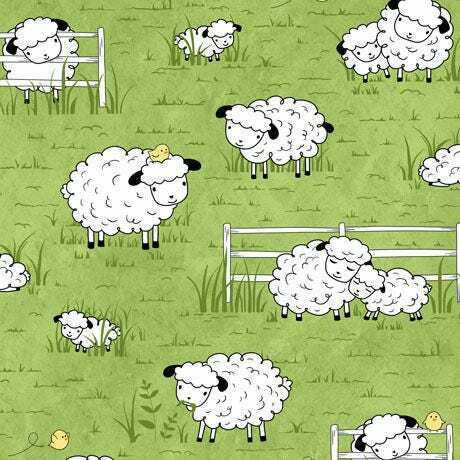 What is cuter than sheep? Sheep with their peeps! Adorable illustrations from © Alicia Dujets for Studio 8. The sweet palette of fresh green and butter yellows with hints of black are a great gender neutral option for babies! So many possibilities with this sweet fabric. Add this fabric with one of the coordinating prints. This fabric measures 44 inches wide. Sheep measure approximately 1 inches in height and 1 1/2 inches in length. All fabric from The Quilted Nursery Children's Fabric Store is cut directly from the bolt. The Quilted Nursery Children's Fabric Store now offers fractional quantities for your fabric sizes. All shipping overages are refunded upon shipment of fabric! Great service, quality and shipping. I would definitely order from them again. This is the 'cutest' fabric and is the perfect backing for the baby quilt I have planned to make.